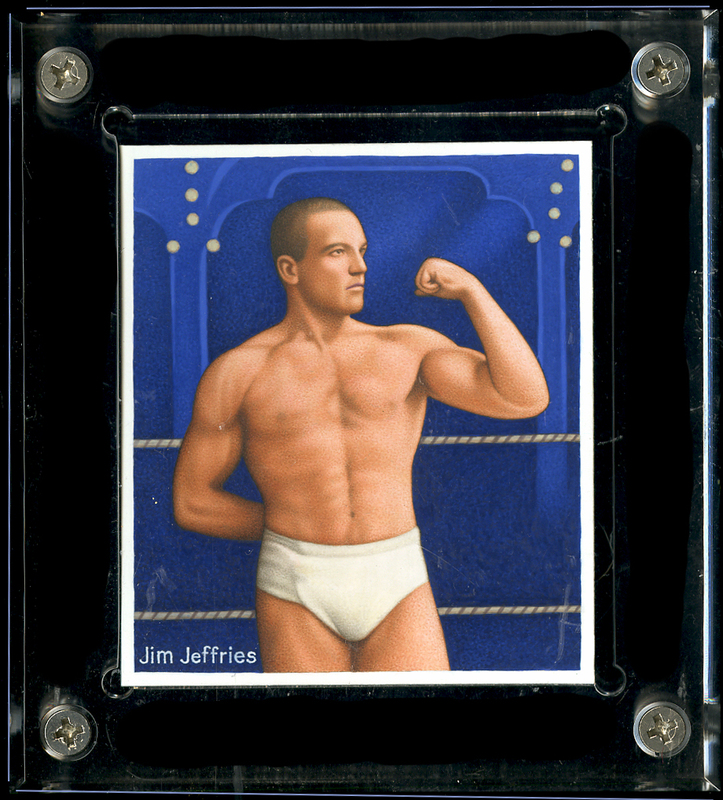 The James J. Jeffries Khedival (often misspelled as Khedivial) Prize Fight Series shows “The Boilermaker” with an extra wide belt featuring the American flag. It would be a colorful and somewhat unique way of breaking up those “tighty whities”. Regardless, it’s a lot better than Billy Papke who was known to fight just wearing a thong! (See Papke vs Ketchel 4.) Yikes!!! No matter what you decide, it’s still a beautiful painting and will make a beautiful card. Great card/great boxer. I’d suggest leaving it as a chase card/ print variation. Possibly showing a little blood stain on another one as a supper chase card, then make the rest with another color that doesn’t quite look like a wrestler from the 50-60’s. Either way, I’d still want it for my collections. thanks and keep up the great art. Yeah, the whities are all I see now when I look at the card. I think I really should change it.